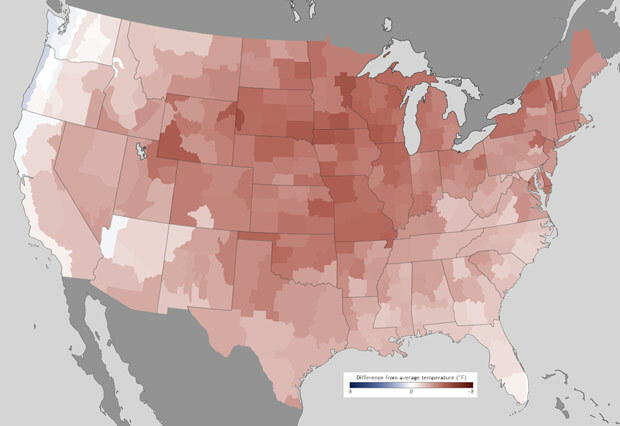 It’s official: 2012 was the country’s warmest year on record. Data from the National Oceanographic and Atmospheric Administration show last year’s average temperature (55.3°F) was nearly half again higher above the national average than the previous record set in 1998. NOAA’s data from August-December is preliminary, but 2012’s heat has a wide margin over past records. Every state in the Lower 48 had an above-average annual average temperature in 2012, and 19 states — including Illinois — appear to have tied or set new records, NOAA said Tuesday. (More weather stations will report data throughout January, confirming NOAA’s initial announcement.) Thirty individual weather stations in the state broke all-time highs. The year started during an exceptionally warm winter and coasted into the warmest spring on record. As downstate farmers and Great Lakes navigators know all too well, the heat baked through “the great drought of 2012.” Illinois was among the driest states in the country, and there appears to be little precipitation on the horizon. Wednesday marks 319 days with less than one inch of snow in Chicago, breaking a 72-year record.